If you’re looking for an unforgettable travel experience in far-flung foreign lands, say hello to our once-in-lifetime Rio and Iguazu Tour. Transporting you to the exotic climes of the Americas, this exclusive journey has been created specifically for Australian travellers, and includes all port fees, taxes, meals and entertainment, not to mention a handful of unforgettable trips and experiences. From the slopes of Sugarloaf to the mighty Iguazu Falls, this 22-night trip lets you experience the exquisite beauty and indelible cultural highlights of Brazil, Argentina and Chile in complete comfort and luxury. Incorporating travel by land, air and sea, you’ll travel to many of South Americas best loved destinations — including Rio de Janeiro, Buenos Aires, Montevideo, Santiago and the Chilean Fjords — providing the absolute trip of a lifetime. Have we caught your attention? Then keep reading, as we take a look at some of the amazing highlights you can look forward to on our Rio and Iguazu Tour. Colourful, vibrant and unique; Brazil’s wonderful second city, Rio de Janeiro, is unlike any other place on earth. The city is divided by a string of steep peaks called the Serra da Carioca, which descend sharply to meet the winding streets on the north and south side of the city. Atop Rio’s rocky spine rests the Christ the Redeemer statue, arguably the city’s most famous landmark. Then of course there’s Sugarloaf Mountain, supporting an incredible cable car ride offering jaw-dropping panoramic views of the city below. 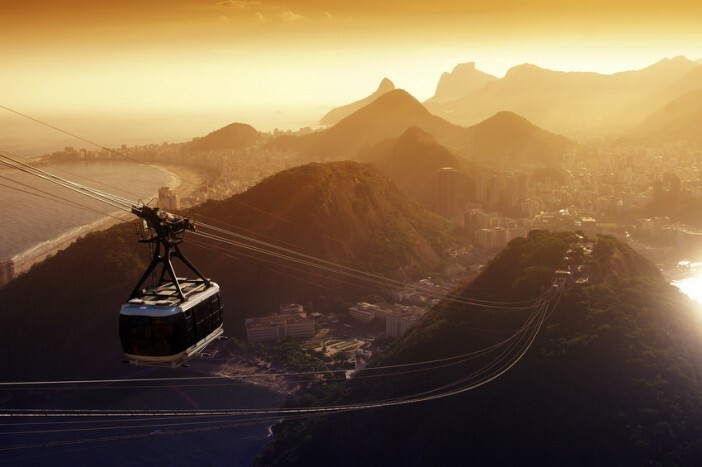 After enjoying the stunning vistas offered at the summit of Sugarloaf, you’ll descend to street level to enjoy a guided tour of Rio’s second most popular tourist attraction, Copacabana Beach. Complete with its 4-mile Balneario Beach, Copacabana is the world’s most famous stretch of sand — attracting thousands of sun worshippers each year. Trust us when we say — nothing compares to the power and beauty of Iguazu Falls. Located on the Paraná Plateau on the border of Brazil and Argentina, this vast fall system features drops of up to 82 metres, making it notably taller and more powerful than Canada’s Niagara Falls. UNESCO protects the falls on account of their incredible scenic splendour, and visitors can now get closer than ever to the cascading water thanks to a series of walkways stretching across the lower course of the river. Travel to the Iguazu Falls as part of this breath-taking tour, and you’ll spend two days exploring the Cataratas Trail, which offers some of the best views of the falls. As part of the walking tour, you’ll get up close to Devil’s Throat, Iguazu’s tallest and fiercest waterfall. Travel excursions don’t come much better than this. After your 6-day land tour of Brazil and Argentina, you’ll board Holland America Line’s luxury ocean liner, ms Zaandam, and cruise south, following South America’s exquisite Atlantic Coast. With its illustrious staterooms and private verandas, ms Zaandam offers a truly opulent travel experience, allowing you to completely relax and unwind after the excitement of the Brazilian land tour. Negotiating South America’s world-renowned Cape Horn, you’ll come upon one of the continent’s most exhilarating spectacles, the Chilean Fjords. With their mighty peaks and sweeping glaciers, the Fjords are among South America’s most beautiful natural features. And, thanks to the intimate proportions of ms Zaandam, you’ll travel right through them, taking in the exquisite beauty of each and every waterway along the way. If you’re interested in booking a place aboard our Rio and Iguazu Tour when it departs on November 2 2016, you can find more information here. Alternatively, to browse our complete range of cruises and tours, visit the Cruise1st Australia homepage or call us on 1300 857 345. Hi Jan, thank you for your enquiry. We have two South America itineraries to choose from. You can either do the tour and then the cruise or the cruise and then the tour. Kind regards, the Cruise1st team.